It will allow the County Council the OPTION of using property tax in the financing of the project. As far as exceeding the statutory limits, that is precisely the intent of the referendum process…to allow you the voter to decide if a project is worthy of exceeding those limits. Under the old system, county leaders would just do as they pleased and pass the cost to property owners. The old process made it much too easy to build the “Taj Mahals” that people remember. This new process is a transparent way to involve the public in deciding what form of taxation is utilized to fund needed projects. No one wants their property tax OR their income taxes raised. I know I don’t…but there are projects that are necessary and proper that must be funded for the public good. The property tax caps were not intended to guarantee that no one would ever pay more than the one percent of assessed value…they were intended to restrict local taxing authorities from unfairly burdening the property tax payers without properly informing them and seeking their approval. The Author goes on to say that “this is going to be a state of the art facility”… I am not sure what else the taxpayers of this county would want or expect. The project is intended to meet the needs of our criminal justice system for the next 25 to 30 years. It is being designed to be the most efficient facility possible. As far as giving inmates better living conditions than most citizens in the county…Come on, that’s silly, it is jail. No one wants to be there. No one wants to pay for them to be there. Let’s refer back to the same constitution and body of statutes that was referenced by the author… Those laws and precepts demand that we provide for public safety. They demand that those found guilty of crime be sentenced. 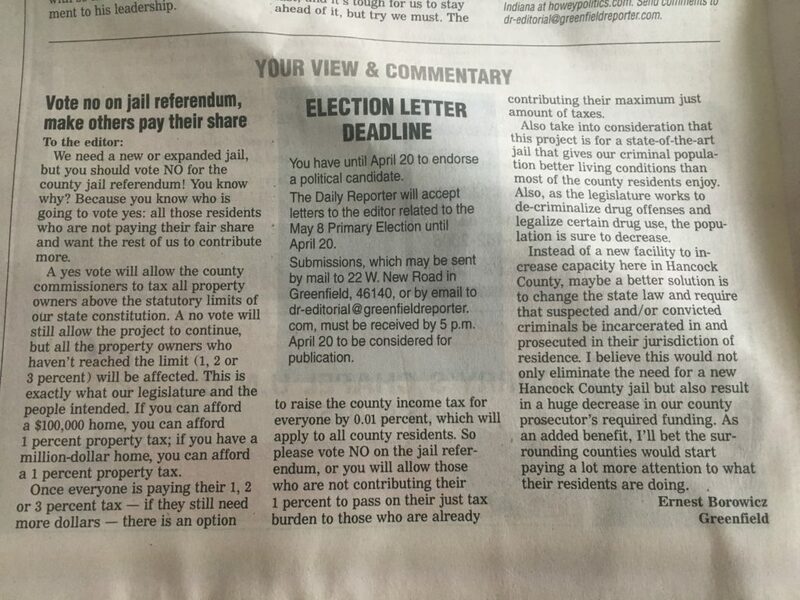 They demand that the sheriff of a county have the facilities to house those sentenced to serve time. They demand that proper care be given and that their sentences be rehabilitative and not punitive in nature. Lastly the author’s idea that the state force incarceration in the person’s county of residence is intriguing on the surface, but it would cause so many unintended consequences and inefficiencies that there is not enough time in this post to address. To the author of the editorial, I understand your frustration with the situation. The situation with overcrowding was delivered to us by a legislature that in an effort to help its own bloated budget devastated countless counties across the state by sending all Level 6 felons to county jails from the state Department of Corrections. The drug/opioid crisis is frustrating and costly both to the lives it effects and to county resources. Local law enforcement, county and state leaders are doing all they can to get in front of it and curb it, but this too is the hand we have been dealt. We must respond to it and do all that can be done to guarantee the public safety of the citizens of Hancock County. This is what the board of commissioners is seeking to do. This is what this project does…regardless of what form of taxes is used to finance it.